Universal accessories are typically universally bad; this product is an exception to the rule. Update, 6/1/2016:The T-Stand is now available for sale. We've requested a shipping unit, so that we can update this preview into a complete hands-on review. We have mixed emotions about covering crowd-funding campaigns here at TechHive. On the one hand, we’re giving a company a big platform to raise cash based on little more than promises. On the other hand, that cash could help bring a terrific product that early backers will typically acquire at a discount (if you’re not taking the time value of money concept into account, that is). 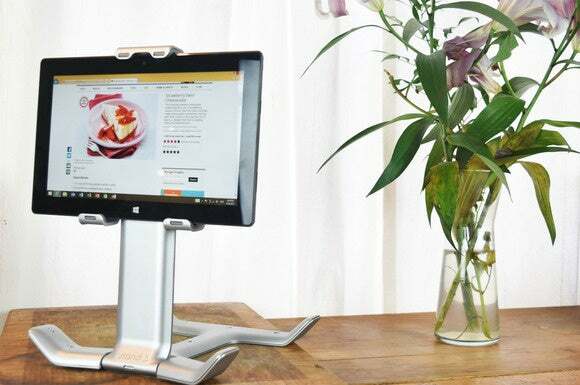 This particular story is a little different because Surface ID sent us a near-final prototype of its T-Stand tablet stand to check out. To be clear, this is a hands-on preview versus a rated review—the T-Stand has yet to go to manufacturing. But if you’re considering backing the T-Stand Kickstarter campaign, we think you’ll find it to be a good value, and Surface ID is offering backers a number of early-bird specials. The campaign—which ends on Monday, November 23—has raised $145,000 against its initial goal of $10,000. Caveat emptor: As with any crowd-funding campaign, there is no guarantee that Surface ID will deliver its product on time or ever. And the device that emerges from the factory could look and perform very differently from this prototype. With that in mind, here’s a look at a T-Stand prototype. We found the T-Stand to be very handy while using a tablet in bed, on a couch, and in a recliner. What do you use a tablet for? Most tablets are designed for casual use: surfing the web, watching videos, listening to music, and so on. But none of the ones I’ve seen make any provision for using them hands-free. Yeah, some of Microsoft’s Surface models have a kickstand, as do some of Lenovo’s Yoga Android tablets; and many tablet cases can add similar features to iPads, Fire tablets, and the like. But kickstands and cases are worthwhile only when you’re using the tablet at a desk or on a countertop. They don’t provide enough stability to balance the tablet on your lap when you’re lounging or riding in a car, bus, or train. And they certainly don’t accommodate a wide variety of viewing angles, so you can use the tablet while you’re lying on the couch or in bed. The T-Stand does—for the most part. Depending on your body’s position and where you put the T-Stand, you’ll probably need to hold it with one hand to keep it from sliding off your legs or belly, and to keep the weight of the tablet from tipping both of them over when the base is in front of the tablet (especially when the tablet is in portrait mode). But keeping the stand in place is much less fatiguing than holding the tablet in front of your face while you read or watch a video. The T-Stand is designed to accommodate tablets with screen sizes ranging from 7 to 13 inches. I used it with a fourth-generation iPad (9.7-inch screen) as well as an Amazon Fire HD 8 (8-inch display). Mounting the tablet in the stand involves resting the bottom edge of the tablet on a pair of hooks, and then pulling the spring-loaded top hook over the top edge of the tablet. The sides of the feet that rest on your leg or belly are a little slippery. Placing silicon pads on the inside surfaces would help. This takes a bit of effort, as you’re pulling on a high-tension spring, but that’s to be desired because it ensures the T-Stand will have a solid grip on the tablet. Thick silicon pads on all three hooks protect the edges of the tablet. 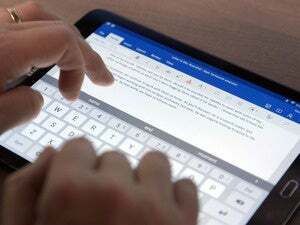 The downside is that you might have to remove the cover from your tablet—you definitely will if it’s a model with a keyboard attached, as is the one on my iPad. I found that wasn’t the case with the Fire HD 8’s thinner, keyboard-free cover. Speaking of keyboards, you can pretty much forget about using one with the T-Stand while you’re in a reclining position, because there’s no way to hold it in place, and one hand will already be occupied anyway. But when you do want to use the tablet at a desk or countertop, just rotate the base all the way around and you get a very stable monitor stand that you can put a keyboard in front of. 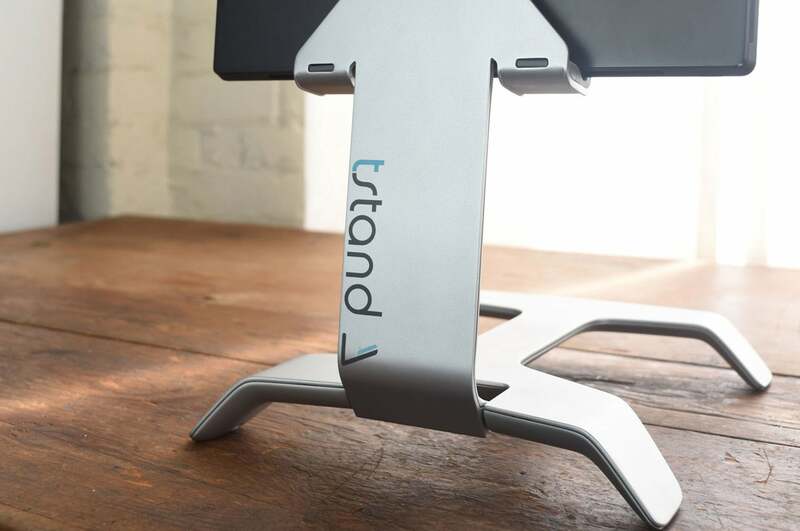 The T-Stand’s reversible base lets you adjust the viewing angle to an almost infinite number of positions on one axis, but you can’t turn it left or right at all. This makes using it a more or less one-person experience. When you’re lying down, the base’s four “feet” somewhat grip your torso, but silicone pads on those feet would be a welcome addition to prevent it from sliding around too much. There are dozens of iPad-specific stands on the market, and a somewhat smaller pool of universal tablet stands. I haven’t seen anything on the market comparable to the T-Stand, especially since it’s not limited to use with one model of tablet. If you switch from an iPad to an Android tablet, or vice versa, you’ll be able to continue using the T-Stand without giving up anything in the way of fit or functionality. If the final product matches the prototype when it ships in December, it will deliver a very good price-to-performance ratio.